The housedress as we know it - a very informal garment to wear at home while lounging or working, loosely-fitted and easy to wash - seems to date to the early twentieth century. Previously, the term could be used to refer to more elaborate and structured clothing, essentially what I'd label "day dress", made of less expensive fabric for the morning and more expensive fabric for the afternoon; around 1910 a shift in usage occurred where people started to label much less formal wrappers, kimonos, and tea gowns as house dresses - although it most commonly seems to have been applied to plain wash dresses (ie, dresses that could be fully laundered). Basically, the nineteenth century housedress was something you were considered "dressed" in, and the twentieth century housedress was coming to be something that was more suitable for doing the morning housework, or just sitting around in. I forget how I first found out about Swirl dresses, but I realized fairly quickly that that was exactly what I needed for throwing on after work in the summer. (This was last year. I'm a slow mover.) The clothing company L. Nachman & Son went into business in the early 20th century, and started making the "Neat'n'Tidy" pinafore apron before 1940; in 1944 they created the "Swirl" wraparound apron, which soon developed into a dress, somewhere between a housedress and an ordinary day dress in formality. You can see a number of extant Swirl dresses and advertisements from the 1940s through 1960s at FuzzieLizzie Vintage Clothing and The Vintage Traveler. As I'm not really a fan of wearing actual vintage or antique clothing, and the point is pretty moot as my dimensions are just large enough to make finding vintage clothes in my size difficult anyway, I decided to buy a Swirl dress, pattern it, and make one of my own. (I then went out and bought a very similar wrap dress pattern in the Simplicity sale at JoAnn on Memorial Day weekend. You know, so I have it.) As the tag says "Swirl / Sanforized" it should date to the early 1950s, according to the sites linked above. The construction is fairly simple. The neckline is cut to the dashed lines and folded down on the solid line to create the facing; the darts are made in the bodice pieces, and the pieces and facings are sewn together at the front and sides, leaving a small gap at the bottom of the left side seam where shown. The skirt pieces are also sewn together, also leaving a small gap on the left side, and with the pocket on the right. 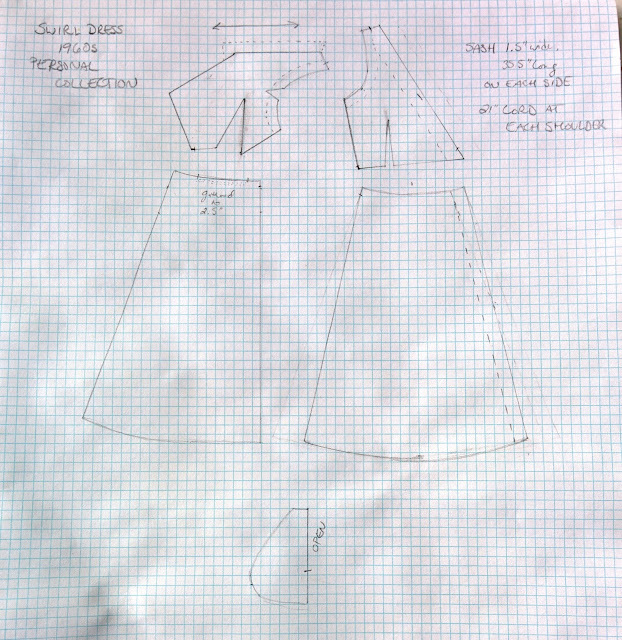 The skirt is gathered where shown in four rows of ruching, then sewn to the bodice. The waistline seam allowance is pressed up toward the bodice and the seam allowances at the gap on the left side are folded back, and the bodice and seam allowances are top-stitched. (Then the folded-back edges of the side slit are top-stitched down.) The back facings are added to the backs and the front facing is folded in; the shoulders are put together right side to right side and the back facings are folded around the fronts, so when you sew the seam and turn it right side out, it envelops the seam allowances. The armscye facings are sewn into circles and then sewn to the dress. There's a self-fabric rouleau, knotted at each end, sewn in the middle to the underside of the shoulder; this ties on top of the shoulder, gathering it in. The hem at the bottom is just turned twice and sewn with a regular straight stitch. The ties are made as tubes to the dimensions described, then turned inside out. They're sewn to the back edges below the mark: placed first along the waist seam so the raw edge is pointing out, sewn, then folded back over that seam and sewn down again. The tie on the right will come through the gap in the left side - the left side of the back is on top, and the dress ties in front. The button is on the right back and the buttonhole on the left, where shown. For my version, I used a length of quilting cotton that I'd bought for curtains last year. I did make a token effort at pattern matching, but as you can see ... once again, total chaos. The pattern had to be sized up, as the original was for a 36" bust and 27" waist; later I took the shoulders up by about an inch. I forgot to add the neckline facing to the pattern and had to cut one out and apply it; I also did away with the armscye facings altogether and just hemmed them. Didn't bother with the shoulder ties, either, and as my sewing machine doesn't handle the changes in tension you need for gathering very well, I just did hand-gathering on the skirt, with no visible ruching. Right now there's no button, as I want to go to the store and get one that matches the stereotypical Swirl spiral style, and I have to say that the button is definitely necessary to the engineering of the dress - it tends to slide off your shoulders if you don't have it. I'm really enjoying it so far! It's not terribly flattering on me (in part because I graded it up a bit too much), but it's very comfortable.